Peel potatoes and cut into 1/4-inch matchsticks. Submerge fries in cold water while you slice the others to prevent browning. Heat a large pot of oil to exactly 325°F. Use a deep fry thermometer! Dry fries well in batches and once dry, add slowly to oil. Fry the potatoes for 4 minutes then remove and let drain. They will be mostly cooked at this point, but not browned at all. When all the frites are fried, heat oil to 375°F. When oil is hot, cook the fries for a second time in the hotter oil for 3-4 minutes. They should turn perfectly crispy and brown. Remove fries from oil and let drain on a few paper towels. Season fries immediately with salt while hot. Serve fries with wasabi ketchup and/or honey mustard. You might think that French fries and frites are the same thing, but I would disagree. French fries are something you get or make on a whim. They are what fast food restaurants pump out in huge quantities. They are flimsy, salty, and need lots of ketchup. Meanwhile, homemade frites are an entirely different beast. They are sturdy, so very crunchy, and unfortunately require a bit more work to perfect. Once you master them though, you’ll have a hard time going back to their lesser fried cousin – and you won’t mind the extra work involved one bit! There’s no need to get fancy on the potato front for these. Just plain Russet potatoes work great. Peel them and cut them into planks and then fries. I shoot for fries that are about 1/4-inch thick. 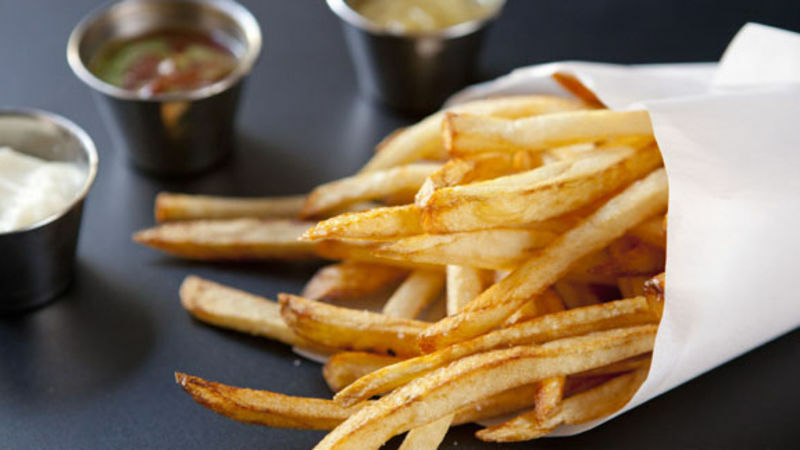 Once your fries are chopped, move them to a large bowl of cold water. This does two things: First, it ensures that your potatoes don’t turn brown – which can lead to a pretty unappealing fry. Second, and more importantly, it washes off the starch on the potatoes which will keep them from sticking together as they are frying. The annoying part of making really good potatoes is that you have to fry them twice. There’s just no other way. While this does take a bit more skill and time, it’s not actually that much more work since you already have a frying setup. The first fry is at a low temperature (325 degrees F). Temperature is really important, so be sure to use a thermometer and don’t eyeball it. If the oil is too hot, you’ll end up with flimsy French fries instead of perfect frites. Once your oil is the right temperature, remove a handful of fries from the water and dry them very well (unless you like grease fires). Once the fries are dry, gently add them to the oil and let them fry for 5 minutes. Add them slowly to the pot and make sure not to add too many at once or your oil might overflow. Once the fries have fried for five minutes, remove them with tongs. They will look very unappealing at this point and that’s okay. The important part is that they are cooked and most of the liquid is removed from the fries. Now for the fun part. Once you have fried all of your potatoes at the low temperature, let them drain and cool while you crank the temperature up on your oil to a blistering 375 degrees F. You might not think that 50 degrees makes a difference, but it is huge. When your oil hits that temperature, again, fry the potatoes in batches for 3-4 minutes until they are golden brown. On this second, much hotter fry, they will immediately crisp up and turn a perfect golden brown. When they come out of the fryer, season them with salt immediately. Serve them with some fun dips! Personally, I like wasabi ketchup, honey mustard, and homemade mayo. If you don’t have time to make homemade mayo, just skip it. It only takes a few minutes if you have the ambition – I did a walkthrough on homemade mayo on my blog. Make these. Ditch the flimsy fries. Never look back. Nick maybe ate one of these for breakfast and for dessert. Be sure to check out his blog, Macheesmo, and follow him on his Tablespoon Profile.